India has joined an UN network to halve maternal, newborn deaths. The Network for Improving Quality of Care for Maternal, Newborn and Child Health is a global health network focused on improving the quality of care for new mothers and babies. With this, India has became the 9th country to join this network. Other contries in the network are Bangladesh, Ivory Coast, Ethiopia, Ghana, Malawi, Nigeria, Tanzania and Uganda. The Indian Space Research Organisation (ISRO) today made history by successfully launcheing 104 satellites in one go. Its PSLV launch system carried a 714-kg Cartosat-2 series earth observing satellite and 103 co-passenger satellites together weighing about 664 kg. 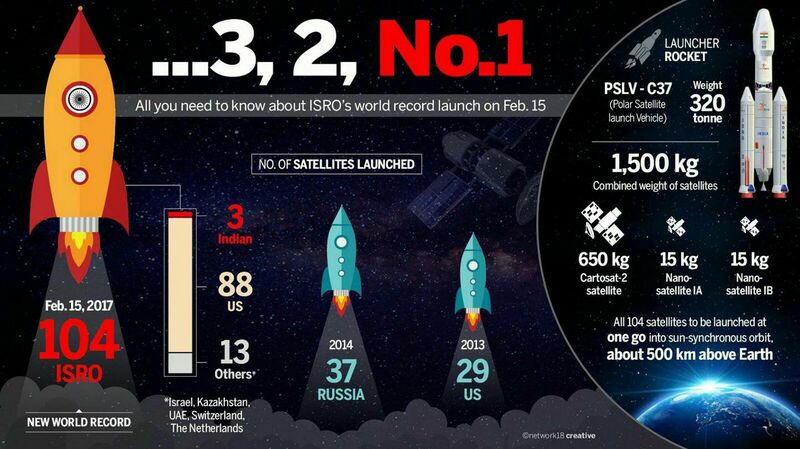 With this, ISRO has broke the world record for the most number of satellites launched from a single rocket. Russia held the previous record of 37 satellites, launched in 2014. Infibeam, the first e-commerce company in India listed with SEBI, has announced plans to merge operations with online payment gateway CCAvenue. The deal is expected to value CCAvenue at ₹2,000 crore. Founded in 2010 by former Amazon executive Vishal Mehta, Infibeam will also invest ₹150 crore for a 7.5% stake in CCAvenue, in addition to the 3.85% it currently owns. The Kalimpong subdivision of the Darjeeling hills became the 21st district of West Bengal. Carved out of Bengal's northernmost hill district of Darjeeling, Kalimpong district is spread over 1,056 square kilometers and with a population of just under 50,000, is also densely populated Bengal's least populated district. The Centre for Indian Music Experience in Bengaluru is scheduled to open between March and June 2017. The three-storey museum with 20,000 square feet of exhibition space will feature Bollywood, Hindustani, Carnatic and regional music. The government has increased the immediate assistance to rescued bonded labourers to ₹20,000 from ₹5,000, Labour Minister Bandaru Dattatreya announced today. Besides, financial assistance for adult male beneficiaries was hiked to ₹1 lakh from the existing ₹20,000. It has been increased to ₹2 lakh for females and minors, and to ₹3 lakh for the most deprived and marginalised victims. India and Croatia have signed an agreement to boost bilateral trade and enhance economic cooperation. The agreement was signed by Commerce and Industry Minister Nirmala Sitharaman and Martina Dalic, Deputy Prime Minister and Minister of the Economy, Government of the Republic of Croatia, in Zagreb. Singer Justin Bieber is set to perform in India (Mumbai) for the first time in May as part of his Purpose World Tour 2017. India is in talks to sell short-range surface-to-air Akash missiles to Vietnam, the head of Defence Research and Development Organisation (DRDO) has announced today. The move is in line with Prime Minister Narendra Modi's wish to establish India as an arms exporter. Modi had also announced a $500 million credit line to Vietnam to buy defence equipment last year. Hyderabad-based GVK Power & Infrastructure, which runs the Mumbai and Bengaluru airports, today won the bid to develop Mumbai's second airport in Navi Mumbai. American gymnast Simone Biles and Jamaican sprinter Usain Bolt have won the Laureus Sportswoman and Sportsman of the Year awards respectively. The central government has released an action plan to make football a 'sport of choice' in India. Through the 'Mission XI Million' programme announced last year, the government plans to engage 11 million Indian children in football-related activities. The programme, will be rolled out by September this year spanning across 12,000 schools in 37 cities across all 29 states. Indian women's cricket team captain Mithali Raj has become the second woman player to cross 5,500 runs in ODIs, achieving the feat during India's women's World Cup qualifier against South Africa today. Sandeep Singh has become the second hockey player in the country to receive an honorary doctorate, being awarded one for "sporting excellence" by Desh Bhagat University, a private institution in Punjab. Former captain and current Member of Parliament, Dilip Tirkey, was the first Indian hockey player to be awarded an honorary doctorate, being given one by Sambalpur University in 2010. India's maiden sport-themed literary festival, SporTale, will be held in Pune on February 21 and 22. The event will feature as many as 38 luminaries from the field of sports, media, cinema, books and photography. Virat Kohli, Virender Sehwag, VVS Laxman, Shane Warne and Dipa Karmakar will be speaking at the event among others.